RO systems do NOT remove bacteria or pathogens from your water, although many mistakenly believe they will. In fact, RO manufactures are generally very careful to point out that RO is "not recommended for use with water that is Microbiologically Unsafe or of Unknown Quality". RO will remove heavy metals like lead, arsenic and mercury, but is simply not able to eliminate bacteria. Ultra Violet (UV) Sterilization is the most effective and economic way to treat all of your water in your Whole-House immediately (on demand and without holding tanks) and to eliminate bacteria and viruses including chlorine-resistant organisms like Giardia and Cryptosporidium! Care Free Product's UV Sterilization systems are guaranteed to eliminate 99.99% of bacteria including coliform, E.coli, Salmonella, Giardia, Cryptosporidium and other water-borne micro-organisms that can cause diseases. 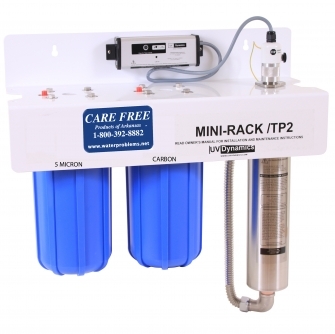 Buy RO systems to remove metals but buy Care Free Product's UV Sterilizer systems to remove Bacteria!